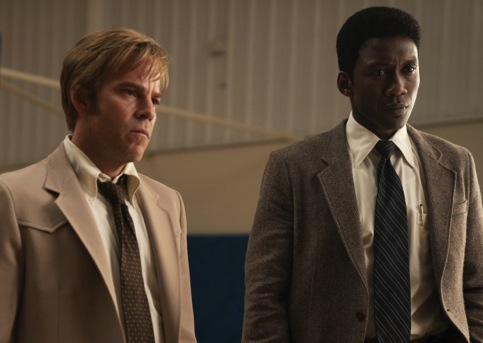 Although not a complete implosion, Season Two of True Detective had serious structural damage compared to the foundation laid by the fictional whodunit’s acclaimed first edition. So HBO pondered a while after S2 ended back on Aug. 9, 2015. Did creator/writer/producer Nic Pizzolatto have another compellingly swervy story to tell? Or had he pretty much punched his ticket with the Emmy-lauded S1, which teamed Matthew McConaughey and Woody Harrelson to near-perfection? You’ll be the final judge of that when True Detective launches another eight-episode run on Sunday, Jan. 13th. But from this perspective, Pizzolatto has made himself whole again with this tale of two Arkansas dicks struggling to solve the mysteries behind the murder of a 12-year-old boy and the disappearance of his 10-year-old sister. McConaughey and Harrelson remained tied to the series as co-executive producers, mostly in name only. But the two leads are played by Oscar-winner Mahershala Ali (Moonlight) and Stephen Dorff, who to this point has been largely a journeyman. HBO made the first five hours available for review. Format-wise, they mirror Season One, with the two central characters time-traveling between the year the crimes were committed, a re-investigation 10 years later, and the present-day circumstances of detectives Wayne Hays (Ali) and Roland West (Dorff). Pizzolatto also goes back to the S1 well in terms of marital discords, highly questionable police work, symbolic clues at the principal crime scene, a corpse posed in prayer, a church that may not be all that redemptive and a small-town rural setting. This time it’s West Finger, Arkansas, in the heart of the Ozarks, where on Nov. 7, 1980, Will Purcell and his sister, Julie, went riding off on their bikes after promising their father they’d be home by 5:30 p.m. Neither returned. Hays, a Vietnam veteran and expert tracker, is referred to by his partner as “Purple Haze.” They get along just fine, both personally and professionally. Hays is the stoic one, mostly leaving West to stir the conversational drinks. In short, they have each other’s backs. But in the end, it’s not as simple as that. Things tend to dawdle at times, particularly during Hays’ slow-burning courtship of school teacher Amelia Reardon (Carmen Ejogo), who’s taught both of the victimized children. The title, after all, is True Detective, not True Romance. But just when things seem to be bogging down, they tend to pick back up in a hurry. Other characters of import include the two kids’ father, Tom (Scoot McNairy), his run-around wife, Lucy (Mamie Gummer), a Native-American trash collector named Brett Woodard (Michael Greyeyes) and the elderly Hays’ grown son, Henry (Ray Fisher). Ali is impressive in all three life stages, but his performance as the haunted and addled 70-year-old Hays has the most resonance. It’s hard to say much more without giving too much away. Suffice it to say that Hays has never shaken loose from what’s now become a cold case. But what can be done about that at this late stage of his life? “Whatever brains I got left, I wanna finish this,” Hays declares. Yes, please do. Season Three of True Detective doesn’t have quite the pulling power of the first go-around, in which McConaughey’s revelatory performance immediately jumped off the screen. But it’s a vast improvement over an overall preposterously ridiculous Season Two fronted by Colin Farrell and Vince Vaughn. Ali, Dorff and their back-and-forth, age-appropriate hair changes make for a duo that’s more straight-ahead than cosmic. McConaughey’s off-the-wall Rust Cohle got away with spouting lines such as, “People are so God damned frail they’d rather put a coin in a wishing well than buy dinner.” It sounded so good rolling off his tongue that who gave a damn whether he made any sense. Hays and West are nuts and bolts in comparison. Let’s just get to the bottom of things. By the end of Episode 5, they’re re-determined to do just that. And I think you’ll also want to stay the bumpy course toward whatever befalls them.